When running an efficient operation, it’s important to keep in mind the right time to replace older, less efficient forklifts. This can reduce your maintenance costs, improve your productivity and most importantly, save money and maximize your return on investment. Forklift maintenance is important – and often overlooked. While many mistakes are the result of not paying attention, a lot of accidents are caused by a forklift not performing up to standards. Accidents can certainly be avoided by performing regular maintenance checks. OSHA requires that all forklift operators undergo safety training, which must be renewed every three years. While employers are responsible for ensuring their employees are trained on the specific equipment they use on the job, a general safety training course prior to operating any forklifts is a requirement. KMH provides you with training classes as well as regular maintenance services for your fleet. Staying ahead of the game on safety keeps you running, saves you thousands of dollars in repairs and complies with all the requirements of law you need to stay in business. Your forklifts need to be regularly serviced; there is no substitute for good maintenance. It ensures forklifts can perform at optimum levels, can detect and rectify minor problems before they affect productivity, and will prolong a forklifts life. It is also helpful to conduct interviews with maintenance personal and operating supervisors who are familiar with the equipment on a daily basis. Your maintenance schedule should specify tasks to be performed daily, monthly, quarterly, semi-annually and annually. Adherence to your maintenance program will help keep your forklift in good condition, prolong its useful life and minimize downtime and costs associated with major repairs. For a multiple point inspection and regular maintenance program for your team, KMH offers a ready fleet of techs that can come to you on a regular basis and keep your fleet and team up to speed with your company’s goals. When Should You Replace Your Forklift(s)? When running an efficient operation, it’s important to keep in mind the right time to replace older, less efficient forklifts. This can reduce your maintenance costs, improve your productivity and most importantly, save money and maximize your return on investment..
Downtime can decrease profits and ultimately, your bottom line is affected, as costs increase due to maintenance when efficiency could be elevated. So how do you determine the right time to make a new, significant purchase? 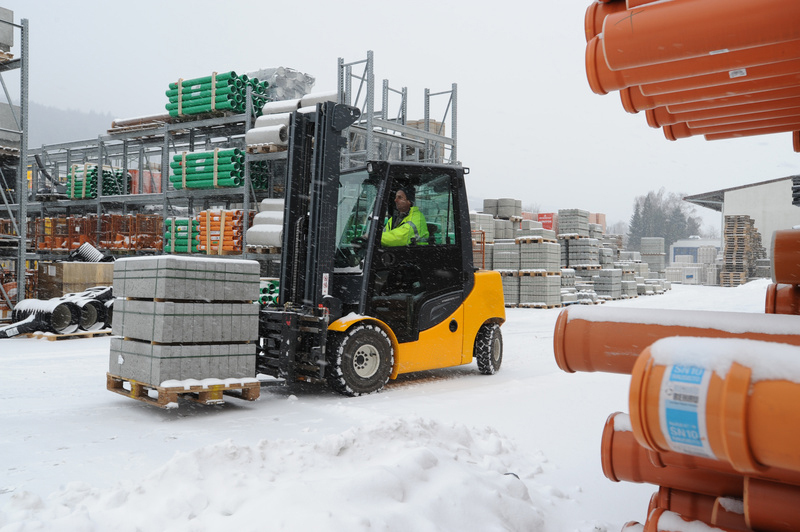 Downtime, due to non-productivity of forklifts, results in a loss of income and should therefore be avoided if possible. How much is each forklift in your fleet costing you to maintain? How much money are you generating by using each forklift? You’ll start to notice on your older machines that the cost to keep them running perfectly is getting higher and higher. If one machine is consistently going over budget, that could be a sign that it is time to trade in and upgrade. The actual bill for the repairs is not the only money you’re spending when your forklifts are being repaired. Every day that a truck is down, it isn’t generating the income that it could be generating for your business. The older it gets the more it will cost which means that the machine will be out of commission longer for more costly hours. How much your forklift is worth? If it needs major repairs, would it be worth it to repair it, then sell it? Should you sell it for parts? Should you trade it in? You can look around online to see what similar models in similar states are going for, which will help you make an informed decision. These three considerations, combined, will give you an idea of when the optimal time to retire your forklift is. A key component of any successful fleet management program is planned replacement. Substantial cost savings are available through the implementation of a fleet management program that incorporates the philosophy of planned fleet replacement once a unit has reached its optimal usefulness threshold. In order to run an efficient and productive operation, the timely replacement of machinery is crucial. You can avoid costly maintenance procedures as well as loss of profits due to downtime and delays. By replacing your forklifts at the optimal economic time, productivity and profits can increase within your business. For your convenience, we have provided a sample daily or pre-shift checklist for your use which outlines items to be inspected. Of course, depending on your application, you may find it useful to include other items. Even if a forklift is not in use on a particular day or shift, it’s worthwhile to note that for future reference. If an O.S.H.A. inspection ever occurred, there would be no gaps in the operation history of that lift truck. Remember though that ALL forklift operators must be authorized and properly trained in safe operation. This is the employer’s responsibility and SuperTech can provide this necessary and O.S.H.A. safety training at your facility. Also ensure that your personnel have read the Operators Manual carefully and made themselves familiar with the lift truck. Remind operators to wear their seatbelt too! Forklift trucks are particularly susceptible to tipovers. Seatbelt use is also enforced by OSHA. OSHA requires a pre-shift inspection of all lift trucks before they are placed into service. Employers must be certain that no condition exists that might adversely affect the safety of the truck. If problems are found, they must be reported and the truck should be taken out of service immediately for repair. A “Warning: Do NOT Operate” Tag should be affixed to the truck, and not removed until the necessary repairs have been made. Since pre-shift inspection is an OSHA requirement, it is important for the employer to be prepared to document that these inspections have been made on a regular basis. Review OSHA 1910.178(q)(7) and 1910.178(p)(1). Does your forklift need parts or service? Reach out to us using the form below and we will get you all fixed up!